The Newcastle United Blog | » Who Was Newcastle’s Best Player Against Sunderland? Who Was Newcastle’s Best Player Against Sunderland? It was again the wort result possible for Newcastle today as Adam Johnson scored in the last minute form a breakaway to make Alan Pardew the first Newcastle manager ever to lose four games in a row to the Black Cats in what was the 151st meeting between the two sides. We also wonder if Alan Pardew understands just how bad this is? Let us know who you think Newcastle’s best player was today, in what was a close and very tense game – especially in the second half. We are now at Manchester United on Boxing Day, and Cheick Tiote managed to pick up his 5th yellow card today, and the 4th in his last four games – and will now miss that game. Perez, and Sissoko, top players! Pardew officially the worst NUFC manager in out history . 4 losses in a row to Sunderland is a complete and utter joke . I hope Pardew gets hit by a bus the fcuking moron . Allardyce was given an ultimatum to start playing decent, attacking, entertaining football or walk. I honestly don’t know whether if faced with the same threat, pardew could respond. It’s far more than just being backed. We have 24M invested in Anita, Cabella and Rivi doing diddly. You need the right stuff or the X factor. Pardew so clearly has neither. @OurToon Thats not the point. Point is, Perez was brilliant again and he needs to play striker, not out wide.. He can be the next Suarez, albeit one that does not bite. Cisse cannot be ahead of him in that respect..
We were going for the winner and looked the more likely to score, but were hit by a sucker punch. I agree that they had the better clear-cut chances, that mostly happened due to us losing the ball when we had committed our full backs and midfield forward.. Losing the ball is down to the player no? As far as Armstrong not squaring it to Sissoko, it was a little inexperience but mostly striker’s instinct.. all strikers would go for goal when given the chance..
Perhaps but I wouldn’t place any blame on him for the defeat as so many have done. This will be one of Eds biggest money making days of the year. Think about it from his perspective. Also it looks like after the next couple of games we will be on another big losing streak FFS . Maybe Pardew can put thais new Sunderland record next to his manager of the month award which he fluked by changing formation due to injuries . Now its back to the same old 4-2-3-1 shite and getting outplayed every week . The Mackems thoroughly deserved the victory and a fair result would probably have been 3-1 to them . We still have to play them again so it will probably be five in a row to them . FCUKING ABYSMAL . PARDEW OUT , PARDEW OUT PARDEW OUT . Cisse missed 3 days of ttraining…..i agree he would have been fit enough for 90 mins but he would have had enough fitness to complete minimum 45 mins. Perez by far the best how good would this kid be with a target man alongside him to win all the physical battles!! Sissokho, taylor and coldback all done well and deserve a shout. Can t believe people are blaming Armstrong he looked tidy enough and done ok for such a young kid. Clearly need a big st in January and to keep hold of sissokho wich in my opinion will be very difficult as I can see a big bid from a top team coming. Siss and perez played well. Unfortunately, the most dangerous team won. We should be at or around 40 points by the end. Shame, but I think this has decided our season: A struggle, with some spankings, a couple shock wins and your hard fought draws. UNLESS: we buy a top CF and 1-2 supertalents in January. That Armstrong should’ve passed to Siss. Oh well. I thought Sunderland deserved to win. It was a text book away performance in my view. I’d by happy if we played like that away from home. One up front for most of the game against a team who cannot score sums Pardew up for me. Regards Gouffran or Cabella, I think Cabella would get the nod from all games now onwards.. But in a derby? Think about it, with tackles and challenges flying in, would you pick Cabella, knowing that he isn’t ready for the physical game yet? I don’t think so..
Now if not Cabella, then who gets to start? What choice is there except Gouffran? Do you think Pardew wanted to start Gouffran? HELL NO! You are probably right. But you never know how bad Cisse was. 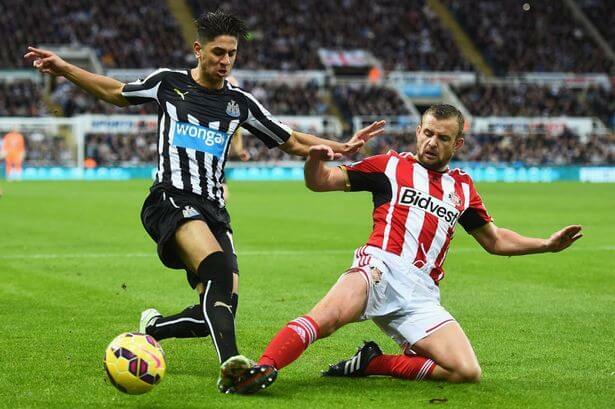 I have to admit I was all over the 6 geordies on the same pitch hyp, so maybe I had the wool pulled over my eyes too! Perez does need games upfront I’m not doubting that mate however we also needed a goal and especially in this game. I’m all for Perez becoming class but not at the expense of us losing now, Perez won’t be here in 2 or 3 years but the memory of the loss will be with you for life. He is consistently good. Has excellent movement. Quick feet. Can head the ball. Fantastic eye for goal and not afraid to get stuck in. Best position is centre forward. it’s simple these tw@ts are fifa and football manager addicts who see football like it is on games. 2.they think a squad who’s best wide man is obatan, best CF is a constant offside poacher and who’s best CB is an aging one is a great squad who just needs a good manager. Oh and I wouldn’t mind if Tiote, Cisse, gouffran and Williamson where moved on in the summer (I do actually rate Tiote but its clear Abied is the future and we will get decent cash for Tiote). So is this what we have to look forward to then eh ? . Lucky to finish mid table watching shocking football and getting turned over by the mackems every season . Last three games against them we have conceded 9 and scored fcuking NONE . Why was Armstrong not a better move than Cisse? He had movement, pace and a couple of attempts on goal. Look, I know Cisse is a great finisher. But he had two airkicks today, and barely had a sniff.. how will we know if Armstrong is good or not good if we do not play him? He’s got to get sacked. When we win, it’s dull turgid, scrappy 1-0, and thats when we are lucky!!! We have far superior players to Sunderland, WBA, and possibly even Southampton & Swansea. The difference is our manager can’t get them playing nice football. Our team is badly missing Aarons and Obertan, until they’re back we can just expect steady football. Perez, colback and Sissoko are premier league quality the rest are to unpredictable to call. Not totally Pardews fault we lost today, chances and luck took a major part, but he is very much to blame the fact that we have lost four in a row as he was for us losing five in a row in the league, despite his three manager of the month awards and his manager of the year that he shares with the the likes of George Burley and Tony Pulis the guy is a total charlatan, maybe that is too harsh but he is a cnut. Spot on mate about lack of awareness from Armstrong bit why didn’t he shoot across the keeper though? If that’s your way of thinking, I think RIviere would have been a better player alongside Perez, rather than either Cisse/Armstrong. One the target man to hold the ball up, the other the tiny skilful man to get in behind and get the goal..
It’s got to be Perez. I think he’s getting better every game and he’s always trying out his moves. Great courage to stick with his style. Cabella would never have survived this rough house match. I do agree that Southampton and Swansea play better football than us with not as many bigger names..
We were on the verge of scoring before then. it was pardumb trying to be a genius instead of doing the obvious smart thing of bring a proven goalscorer in cisse on whilst retaining the shape. Armstrong wasn’t a better choice because he’s unproven at this level, he played midweek and kissed a really good chance, today again he lacked conviction in front of goal. The guy he came on ahead of doesn’t run around and chase the ball bit he knows where the goal is. We lost today because we didn’t score and they did….Armstrong can run and cover more ground than cisse throughout his career but cisse will be more dangerous because he knows where the goals is! !